In a development that won't surprise readers of this blog, but might shock victims of yesterday's hypestorm on CNN (about which I'll say more below), both of our late-week tropical disturbances -- T.S. Erin in the eastern Atlantic, and "Invest 92L" in the Gulf of Mexico -- fizzled on Saturday. These storms were always marginal threats to the U.S., as I tried to make clear, and now they're essentially no threat at all. Erin, the "fish" storm that came off Africa on Tuesday and earned its name Thursday morning, was downgraded Saturday night (for a second time, and likely for good) to a tropical depression. Erin will probably dissipate in the next few days. As for "92L" in the Gulf, it now appears highly unlikely to ever become "Fernand," or even Tropical Depression 6. On Saturday evening, the National Hurricane Center downgraded 92L's chances for tropical cyclone development to just 10 percent, down from roughly 50/50 yesterday. Basically, the "God of Dry Air" and the "Dark Lord Shearon" struck again, tearing 92L (and for that matter, Erin) apart. Stick a fork in them; they're done. Could either system make a Dorian-like comeback from the dead? I suppose it's theoretically possible, especially in Erin's case, as -- much like Dorian -- the storm's remnants will now likely be steered more due west, because there's basically nothing left for the upper-level winds to push north. That said, I wouldn't plan on any resurrections. I think we've heard the last of these systems. Some of the more reliable computer models are projecting that these waves may eventually develop into a succession of tropical cyclones. Such forecasts should always be taken with a huge grain of salt when we're talking about something so hypothetical and so many days in the future. But, in general terms, the prediction does make climatological sense. We're rapidly approaching the seasonal peak for Atlantic hurricanes, and it's around this time that "Cape Verde" storms -- the ones emerging off Africa -- typically start to become an issue. This season has "gotten ahead of itself," in a certain sense. We've had a trio of "Cape Verde"-type storms -- Chantal, Dorian and Erin -- that formed unusually early, then ultimately fizzled, in part because the ocean and the atmosphere aren't quite "seasonally ready" for that sort of development yet. But it now appears the pattern is shifting ("wind is changing! 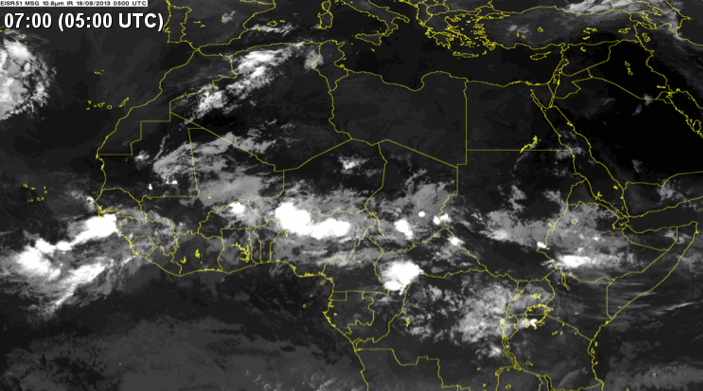 "), as one would expect for this time of year, so it makes sense that we'll probably start to see these African waves have more success, rather than just forming into weak storms and then fizzling out. That said, it's waaaaaaaay too early to say anything meaningful about a (presently purely hypothetical) "proto-Fernand"... or "proto-Gabrielle"... or "proto-Humberto"... that might emerge from the Cape Verde hurricane pipeline. We don't know what will happen. But it's reasonable to suspect that things will start getting more sustainably active in the Atlantic tropics, with significant storms instead of repeated fizzles, in the coming weeks. In fairness to Chad Myers, his on-air statement was heavily caveated (but of course the headline-writers on the CNN website didn't notice that). Also in fairness to him, by "explode" he undoubtedly meant something like 2007's Humberto, which strengthened from an unnamed nothingburger to a Category 1 hurricane in 24 hours. That was never likely here -- because, ahem, warm ocean temperature is only one ingredient of hurricane formation; it is a necessary but not sufficient condition for "explosive" development -- but I guess something sorta like it was at least conceivable. Unfortunately, when average people hear "storm in Gulf could explode at time," they think of something like Katrina, Rita or Wilma -- not a tropical wave that could, maybe, in theory, "explode" into a minimal hurricane (but almost certainly won't). CNN BREAKING NEWS: RIGHT NOW, INVEST 92L STILL HAS NOT YET "EXPLODED." WE WILL UPDATE YOU AT THE BOTTOM OF THE HOUR. BACK TO YOU, ANDERSON. CNN WEATHER BULLETIN!! 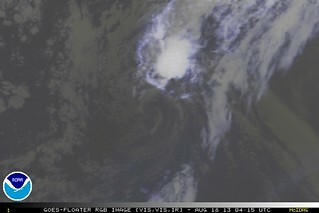 NEW CUMULUS CLOUD HAS APPEARED NEAR CENTER OF #92L. COULD BE HARBINGER OF "EXPLOSION." STAY TUNED TO CNN FOR UPDATES. Coming up next on @CNN: Could the Gulf disturbance, Invest #92L, become a #Sharknado? Chad Myers has the very latest, after this break. TV weather folks, you've got to avoid crap like this. Save the sensationalism for the storms that actually deserve it. Otherwise, when the Big One is bearing down on somebody, your pleas for people to take the major threats seriously are going to fall on deafer ears than they otherwise might. The second "side-issue" is an interesting tidbit of information about the National Hurricane Center's plans that emerged by accident on Friday. First, a quick bit of background: you've seen me call the Gulf disturbance "Invest 92L." That's a non-unique identifier that the NHC uses to describe a potential storm that it's watching for possible development, and tracking with computer models, but that hasn't yet developed sufficiently to "initiate advisories." Such systems are discussed in NHC's "Tropical Weather Outlooks," but no official forecast or storm-specific advisory is issued unless and until an "invest" becomes a tropical depression or storm.
.@wxbrad This year NHC is experimenting in house with track/intensity forecasts for disturbances with high chance of formation.
.@wxbrad Experimental in-house NHC track/intensity forecasts for disturbances not intended for public release. A preview of coming attractions, perhaps? Revealed by an accidental leak! Ha! Speaking of "coming attractions": as I said, this will be my last post on Erin and 92L unless something very unexpected happens...but for the latest on the tropics in general, including those possible waves coming off Africa over the next ~10 days, check back here at Weather Nerd, and also follow me on Twitter, where I will tweet or RT any significant developments.